The full name of this attraction is "Indiana Jones Adventure: Temple of the Crystal Skull." Here you will climb aboard an oversized jeep for a wild ride inspired by the Indiana Jones movies, traveling around a jungle temple, dodging booby traps and scary, supernatural foes in your quest to find the Fountain of Youth. While this attraction has modern special effects and magnificent attention to detail, the real star of the ride is quite possible the ride vehicles. Although they follow a track like an older-style Fantasyland ride, the carriage that you're sitting in also moves independent of the chassis. This enhances the movement you feel on the attraction, sort of like an open-air version of Star Tours. The vehicles can also change speed, and even stop and back up. The execution of this Indiana Jones Adventure is similar to its counterpart in California. There are several differences worth noting though. I think the biggest difference for me is that the entire Lost River Delta area of DisneySea is designed to support the Indiana Jones attraction. The area theming and even the shops and restaurants all fit the Indiana Jones look and feel. The "stage" for this attraction has been set long before you even get in line. California's version, on the other hand, is tucked almost inconspicuously in a corner of Adventureland. The ride's storyline is also a bit different. In DisneySea, the story is set in South America (California's is set somewhere in Asia). However, unless you are a "fan" and have ridden the California version several times, you'll be hard pressed to distinguish the story differences between the two attractions. This is a popular attraction and the lines tend to be long—sometimes very long. One redeeming quality is that the queue area is nearly as spectacular as the ride itself. The detailing is stunning, and there's even a lighthearted mini-movie that describes the safety features of the ride to entertain you on your way to the boarding area. I will have to say that while I enjoy this attraction, it's not my favorite. The problem for me, ironically, is the ride vehicles. They move around too much and too abruptly; you are jerked back and forth and side to side, so much so that it's uncomfortable. 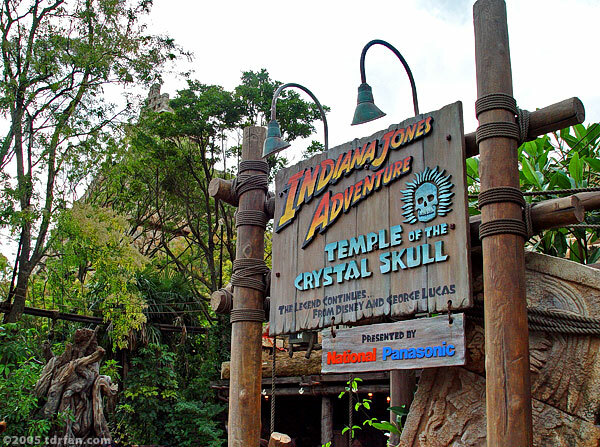 Many people consider the Indiana Jones Adventure rides some of the best in theme park history, and I don't want to discourage anyone that wants to ride from doing so. However, if you like your theme park rides nice and smooth, you may wish to avoid this attraction.